In one of my classes last week, I was shocked and disgusted to see several boys dipping during class. In case you don't already know, "dipping" means stuffing your lower lip with chewing tobacco, often called Snuff. The boys would pack their lip and would then proceed to spit excess brown saliva into empty water bottles. Although I know many people participate in this activity, I personally find it repulsive. Needless to say, in addition to being simply disgusting, it is very detrimental to one's health. Many would think, "I don't smoke it and I don't swallow it. What's the danger in that?" Let me tell you. First of all, dipping tobacco contains nicotine, which is a highly addictive substance also found in cigarettes. Secondly, it can cause oral cancer and tooth loss. Thirdly, it causes cardiovascular problems. All you dippers out there, after reading that list do you still feel like dipping? Personally, I am appauled that this is even legal! I mean, cmon...nuclear waste?! insecticides and motor fuel!? After being informed on the horrible ingredients that make up chewing tobacco, I am not even slightly surprised that this is a cause of oral cancer. Classified as a carcinogen, chewing tobacco has been found to cause lip, tongue, cheek, throat, and mouth cancer. In addition, chewing tobacco contains a lot of sugar, which forms an acid that wears away tooth enamel. Bill Tuttle, a professional baseball player, admitted to many years of tobacco chewing. As a result, he ended up with a cancerous tumor on his cheek and unfortunately the doctors had to remove his jawbone, right cheekbone, several teeth, gumline, and taste buds. After all that, he still had to deal with cancer and eventually lost his battle. Here is another baseball player, Rick Bender, who also suffered mouth cancer due to chewing tobacco. Obviously, he lost much of his jaw and has suffered a lot. He now speaks about the dangers of chewing tobacco. In addition to the cancer risk, chewing tobacco also causes cardiovascular problems. This is because of the stimulant nicotine, which speeds up the heartrate and elevates blood pressure, causing irregular heartbeats. These symptoms can lead to a heart attack or stroke. Overall, chewing tobacco simply is not worth the risks. If you like the habit of having something in your mouth, chew gum! If you really are addicted, look into ways to get yourself better, like a nicotine patch. 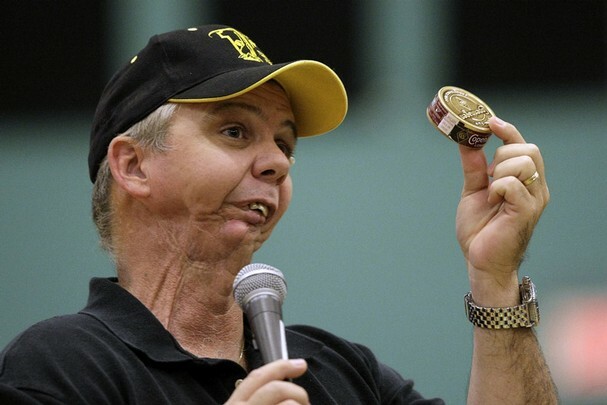 There are far too many dangers to chewing tobacco to even risk doing it once. You deserve better for yourself! Check out this video to learn more about Rick Bender's story and his effect on young kids. I am so happy you blogged about this because I could not agree with you more. Just last night I went down to my friends room in my building and I saw him chewing tobacco and I was absolutely disgusted. He even said himself that he thought it was disgusting. That list of ingredients makes me sick to my stomach and I will never be able to understand why someone would want to put that stuff in their mouth. I would agree with you that it's surprising that this substance isn't illegal. Interested in that area of this topic, I tried to find some research on any instances where people have tried to ban it. I came across an article that discusses tobacco use in the MLB. As you mentioned above, the two people who suffered the consequences from chewing tobacco were in the major leagues. Although the substance was not banned, the league did put restrictions on when it could and couldn't be used by the players. Despite it not being completely banned, it is definitely a step in the right direction! Believe me...I know how repulsive dip is. My brother started doing chewing tobacco when he was 15 years old..he is now 25. He has tried to quit several times. Sometimes he can't even last a day when he is trying to quit. I also noticed that whenever he tries to quit, he gains weight and has uncontrollable eating habits. Upon reading your blog, I decided to reasearch why he may gain weight from trying to quit...according to this article: http://www.ucanquit2.org/facts/AvoidWeightGain.aspx ... the act of quitting nicotine may make one more drawn to food. This makes sense since nicotine is such an overpowering addiction. Another thing I do not understand about chewing tobacco is why it is so common in sports, especially major league teams. There is no hiding the health risks of this addictive substance...so why are players permitted to spit during games, in baseball for example. Another good point is brough up in this article: http://usatoday30.usatoday.com/sports/baseball/story/2011-09-26/baseball-cant-kick-tobacco-habit/50559914/1. The article reminds us that these players serve as role models for many kids. Is that why many kids on high school baseball teams begin to dip?? Then again, Jeremy Affeldt makes a good point...they don't monitor the food they eat..why should tobbacco use be prohibited. Unfortunately Sam, us humans do things that are bad for us everyday. Like Andrew says in class...humans continued to smoke even though evidence and results were coming out about the dangers. Do you think that for us human beings, it takes getting cancer or some other bad health risks to stop doing things that are detrimental to our health. Clearly that's how it worked for Rick Bender. Chewing tobacco is absolutely one of the grossest things there is out there. I haven't ever seen girls doing dip but I see boys do it all the time. I don't understand why they would want to spit into a cup. I have had many guy friends, especially when I was in high school become very addicted to chewing tobacco. Chewing tobacco is not a safe alternative for smoking cigarettes. Many people think because you are not inhaling smoke that this alternative is "better" and they are so misinformed. Like you said in this blog, it has a number of drugs that keep you addicted, and it’s so detrimental for your health. Many of my guy friends that do dip never swallow the spit because apparently it will make you throw up if you do. So not only is it addictive and causes cancer, it can also make you sick. This is a great post. There's a lot of useful information here. I hope users read it! I can't believe the ingredients in chewing tobacco...that's disgusting. I used to notice in high school that kids on the baseball team would dip, and they would leave the dirty water bottle with the used tobacco in the parking lot. I hated it. One of my best friends does this, and it really bothers me. He says he isn't addicted to it, and he mostly does it when he drinks. I think it's terrible regardless. The article below talks about cigarette smoking versus chewing tobacco. It says that a lot of people that try to quit smoking go to chewing tobacco temporarily, but that just seems like a bad idea to me. According to the article, one third of major league baseball players chew...that fraction is way too big. Don't people realize the effects? I totally agree. I feel many people have it in their heads that dipping isn't "that bad" because you are not inhaling anything. I like how you really emphasized the more hidden effects of dipping on your health. I'm a business major, and this made me think of an experience I had the other day. I'm in the midst of looking for summer internships, and the company Altria came in to one of my classes and were elaborating on their internship programs. Altria is the parent company for American Tabacco Company, so Skoal and Copenhagen, and Black and Milds, and a few more. I was so turned off by this. The internship program was interesting but I couldn't help but think, how could I help market companies like Skoal and Copenhagen when I despise the product? I truely believe the more publicity associations like the American Cancer Association, or different health groups spread the word about the negative effects of these substances the larger the effect will be on the psych of the users. The company's, like Skoal for example, and the substance itself almost brainwash the user to believe that it's OK and that there are positives to using. While we non-users focus on the negatives, which lead us to not want to be associated with this product. It's all about the psychology of advertising. I found this quote which is basically what I'm getting at "Advertisements are sometimes spoken of as the nervous system of the business world ... As our nervous system is constructed to give us all the possible sensations from objects, so the advertisenent which is comparable to the nervous system must awaken in the reader as many different kinds of images as the object itself can excite" ...along with this article. Subscribe to receive notifications of follow up comments via email. We are processing your request. If you don't see any confirmation within 30 seconds, please reload your page. Try to Keep Your Cell Phone Away From Your Ta-Ta's, Ladies!